The data revolution currently taking place in health care offers many opportunities for radiology departments, but it requires foresight and planning to make the most of them. Quality and safety are two areas that are ripe for improvement, but they will require radiologists to broaden their concept of quality. The growing emphasis on value over volume means that radiologists will not only have to demonstrate how they improve patient care, they’ll be expected to provide better customer service to referring physicians. Kevin W. McEnery, MD, a professor of radiology and the director of innovation in imaging informatics at the University of Texas M. D. Anderson Cancer Center, says radiologists need to make other departments’ work flow more smoothly. McEnery, who is moderating a session at RSNA 2013 about using IT tools to improve quality and safety, says there is readily available data in hospital EMR systems that can improve patient care; it’s just a matter of putting it to use. For example, M. D. Anderson routinely matches its outpatient schedule to their inpatient census to look for conflicts in the imaging schedule. If an inpatient missed a scheduled exam because of his or her hospitalization, the staff contacts the ordering physician to see whether the scan is still needed. McEnery says the key to implementing these types of initiatives is to extend workflow beyond the radiology department. Rather than simply focusing on the studies that need to be read, radiology departments need to think about how the studies are being used in patient care. Data about daily operational changes from the EMR can provide clues as to what other departments may need. Another initiative that M. D. Anderson has undertaken is to monitor the emergency department schedule for patients who may recently have had an interventional procedure. A software program scans emergency admissions in real time and lists recent interventional procedures that were performed. If an interventional radiology patient ends up in the emergency department, an e-mail is automatically generated that notifies interventional fellows and faculty. Someone then contacts the emergency department to let those physicians know to check for complications related to the interventional procedure. In addition to keeping the interventional radiologists in the patient care loop, this protocol generates goodwill from the emergency physicians. “If you’re an emergency room doc, who are you going to refer a patient to: the service that you have to call and can’t get anybody or the service that calls you before you call them?” McEnery asks. He says this type of outreach doesn’t take much effort, but it pays in big dividends. The more radiology can work its way into the mainstream of an institution’s workflow, the more opportunities it will have to demonstrate value. 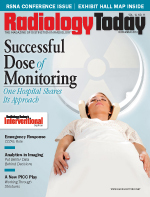 This also has a beneficial effect on the radiology department’s workflow because radiologists are handling patient care proactively rather than reactively. McEnery says IT offers numerous opportunities to extend workflow, but the first step is for radiology departments to determine the policies and procedures that will optimize workflow for their organization. To do that, radiology needs to know when one task was completed relative to the next task that was supposed to be completed. There also needs to be an efficient way for radiologists to provide critical information and an equally efficient way for referrers to respond. Effective protocols require collaboration between radiology departments and ordering physicians as well as agreement about how to measure whether protocols are being implemented. One of the most important technical considerations is structuring data in a format that can be queried, particularly from the RIS, PACS, and dictation systems. McEnery says structured templates and reports can help in this regard. Another important piece of the puzzle is the ability to store data in a single repository, often called a data warehouse, that can catalogue the metadata associated with a patient’s record, such as when the images were obtained, who the ordering physician was, and the type of imaging exam that was performed. This is especially important for larger hospitals and medical systems because queries in production systems can be time consuming and may cause system performance issues. McEnery says most institutions already are tracking metrics because of federal compliance requirements; those facilities are likely to have data warehouse projects. McEnery says radiology will need to transition to a workflow model that demonstrates efficient performance of procedures and timely communication of results. IT can help ensure coordination and consistency across the enterprise, but it will be up to radiologists to reach out. In much the same way that screening mammograms are compared to actual outcomes, McEnery believes radiologists will increasingly be expected to provide actionable information that can be tracked by computers.